A female brown kiwi chick hatched at the Smithsonian Conservation Biology Institute (SCBI) Feb. 3 and is thriving after initially requiring veterinary care. The chick had difficulty hatching, and her legs appeared to be weak. Keepers had been monitoring the egg since placing it in an incubator, which was calibrated to the ideal heat and humidity for a developing kiwi egg, several weeks earlier. They had seen the shell of the egg begin to break, which is called “externally pipping,” and signals that the chick inside would soon hatch. However, the chick remained in the egg for longer than normal. The chick was struggling to kick her way out of the egg. Kiwi kick their way out of their shells with their feet instead of breaking their way out, like other birds, with an egg tooth at the end of their bills. Keepers were monitoring the chick via a camera in her incubator, but after several hours of trying to get out of her egg they intervened. The membranes inside the egg had dried out since the egg had first pipped, holding the shell of the egg together even as the chick inside created more and more cracks in it. Keepers gently helped the chick by making a small cut in the egg where it had pipped. Soon after, she finally emerged out of the egg. Kiwi chicks are independent from birth and do not depend on their parents for food or protection. They are fully developed and are capable of finding their own food within a few days of hatching. A rich yolk sac sustains them during the first few days after they hatch. However, keepers noticed that the chick was having trouble standing and walking 24 hours after she had hatched—which is unusual for a kiwi chick and an indication that she required veterinary care. Veterinarians decided the best course of action was to provide laser therapy to increase the strength in the chick’s legs and ease any inflammation she was experiencing. She received laser therapy for 60 to 90 seconds every day, which was gradually reduced to every other day, for a total of three weeks of therapy. The therapy was painless, non-invasive and performed while the chick was sitting comfortably on a keeper’s arm. The kiwi chick responded well, and veterinarians and keepers saw an improvement after the first treatment. The chick now can walk normally and is developing normally. Therapeutic laser therapy uses photons of light from lasers to penetrate deep into tissues, helping damaged cells repair faster, reduce inflammation and associated discomfort, improve blood vessel performance and accelerate healing through stimulation of collagen production and immune cell stimulation. Treatment times are short and require minimal handling, making this an effective treatment option for many animal patients. The chick has moved to a brooder box, a special enclosure used to acclimate kiwi chicks before moving them to larger enclosures for adults. She is eating on her own and follows a nocturnal schedule. Female kiwi lay the second largest eggs proportional to body weight of any bird. After the female lays the egg, which takes up much of her abdominal cavity, the male incubates it. Keepers move the eggs laid by kiwi pairs at SCBI to incubators to hatch. They regularly candle the eggs, holding the egg against a light, to monitor the chicks’ growth. Kiwi are native to New Zealand, where there are five species. The International Union for Conservation of Nature classifies the brown kiwi as “vulnerable.” The wild population has stabilized after declining due to the introduction of invasive predators, such as the stoat and domestic dog and habitat loss. 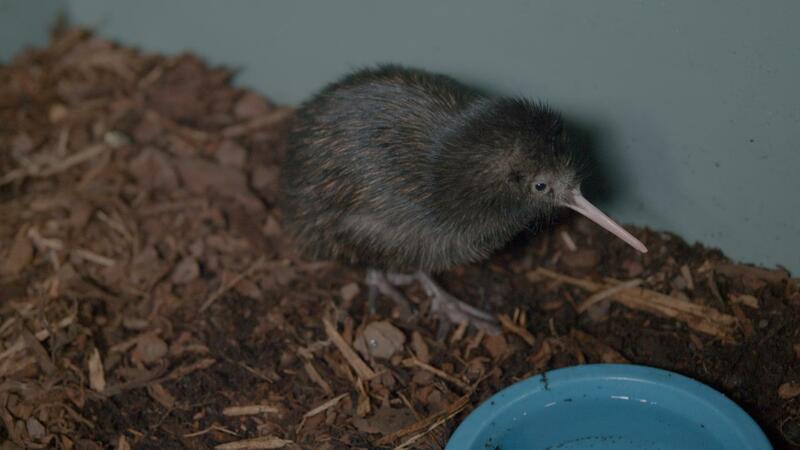 The Smithsonian’s National Zoo was the first to hatch a kiwi outside of New Zealand in 1975. 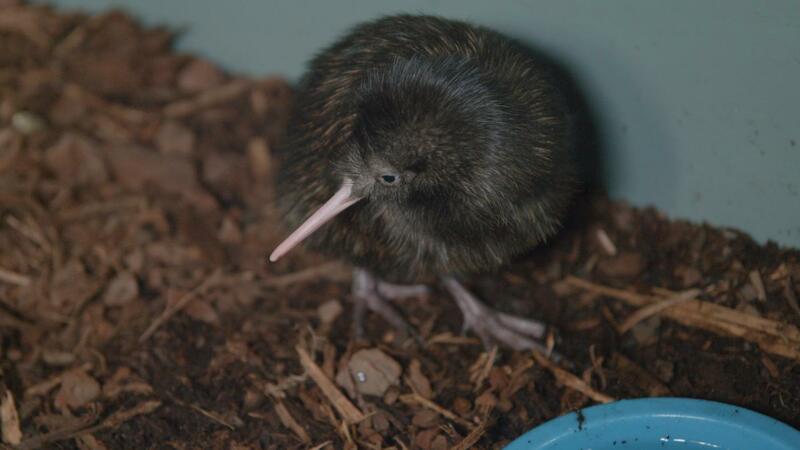 It participates in a Brown Kiwi Species Survival Plan, which coordinates breeding efforts among zoos, to build a genetically healthy population of brown kiwi in human care.